This twisted stack of steel was recovered from the wreck of the World Trade Center. 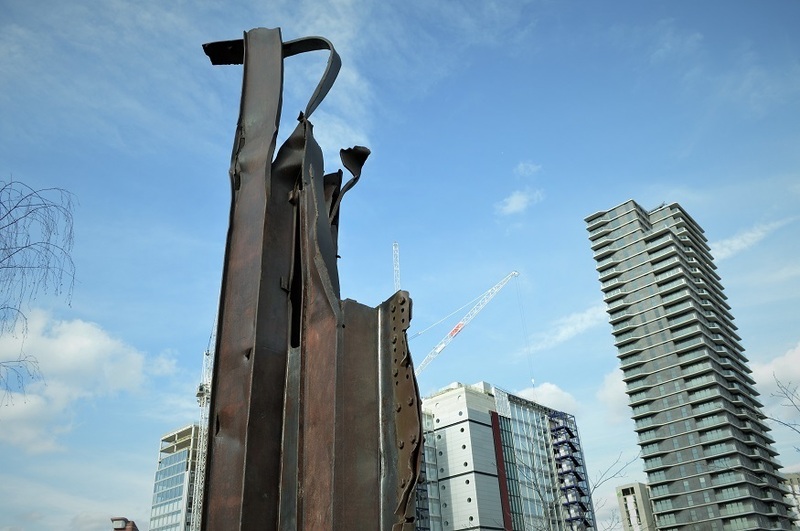 Called 'Since 9/11' (after an educational charity), the memorial was erected in 2015 in a corner of the Olympic Park. You're unlikely to stumble across it. The contorted beams are hidden in a clump of trees, within the dusk shadow of the Aquatics Centre. To reach the monument, you must negotiate a car park, or trek along the bleak Carpenters Road. Not many people will find the memorial. That's a little sad. On the other hand, you're likely to have it to yourself. And this is a memorial best encountered alone. It is impossible to touch the steel without feeling a lump in the throat. We will soon be two decades on from the momentous events of September 11 2001. Even so, this physical reminder can stir strong feelings. Plaques at the base of the monument give a little background. 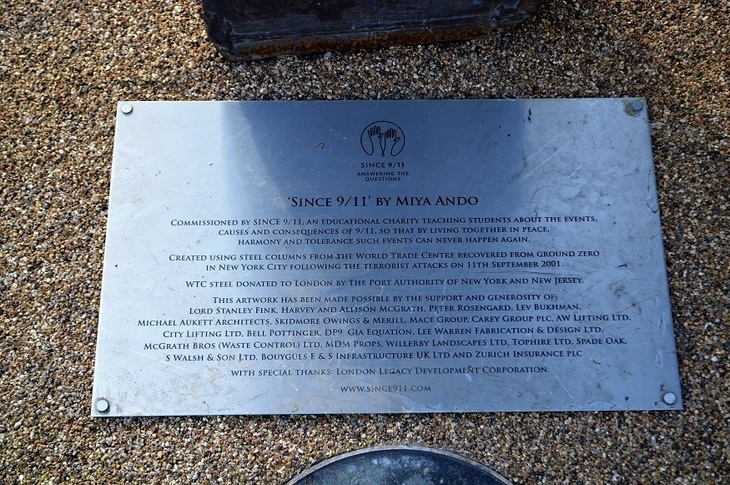 The sculpture was created by artist Miya Ando, with the blessing of the Port Authority of New York. It is one of only six remnants of the Twin Towers to be sent overseas. You may recall that the structure stood briefly in Battersea Park. It proved difficult to find a permanent home for such an emotive object. The Olympic Park eventually took it on, but placed it where few would venture. This bleak corner of Stratford, surrounded by service roads and train lines, feels like something of a compromise. Yet this very isolation forces us to stop and inspect; to contemplate the events of that day; to consider all that has happened, and continues to happen, in consequence. 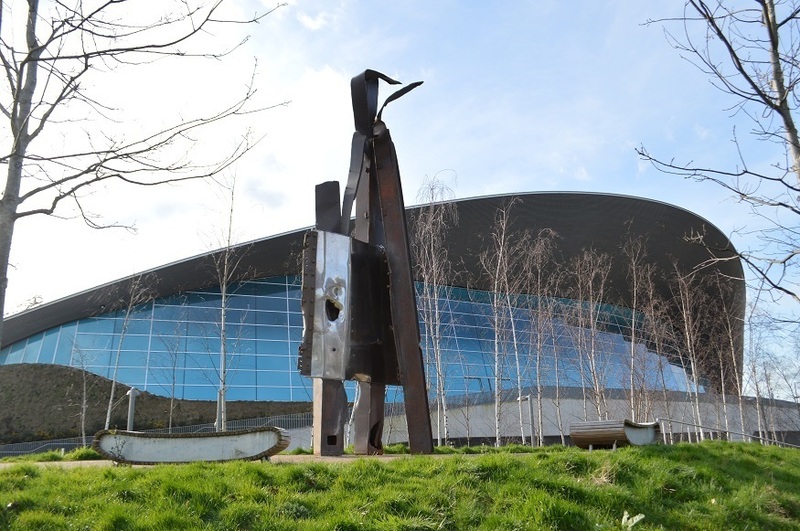 It might just be the most important structure in the Olympic Park.